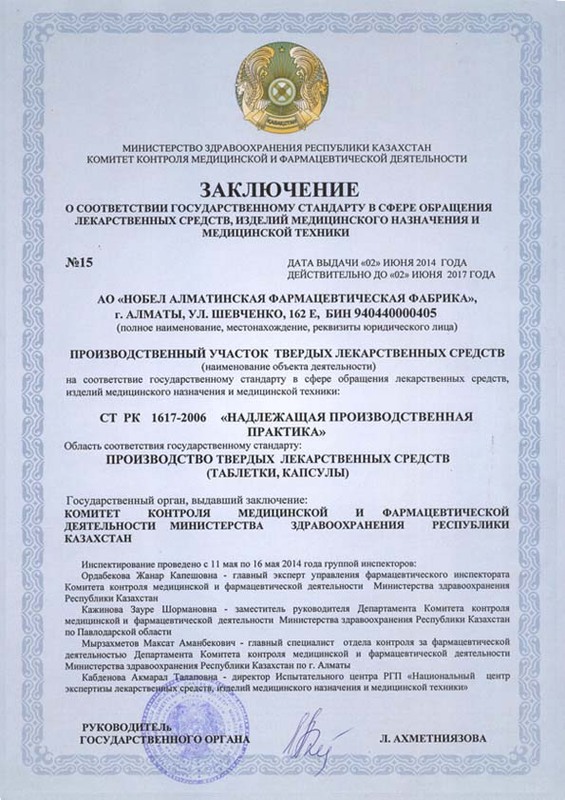 The enterprise is located in Almaty on the territory of more than 10 thousand square meters, has the necessary areas for the operation of main and auxiliary manufacturing facilities, storage facilities, as well as reserve areas for further development. There are all necessary transport and energy communications. Nobel AFF has 4 manufacturing departments specializing in the manufacturing of solid, liquid and soft dosage forms. High quality of products is ensured by equipping the manufacturing sites with high-tech equipment. The manufacturing site is equipped with modern imported equipment, which guarantees the safety of manufacturing process and the environment. The existing manufacturing equipment in the departments are of famous firms from Italy, India, Germany, Switzerland, Turkey and South Korea. The set of manufacturing equipment used is universal and allows manufacturing a wide range of different dosage forms. 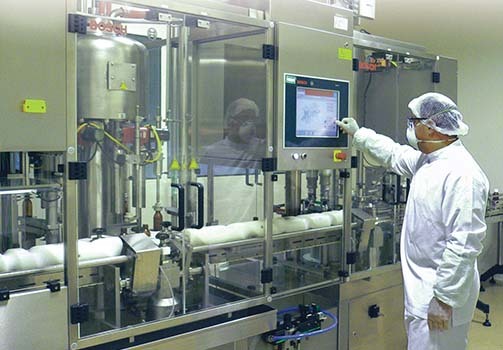 Manufacturing capacity of the company is 750 million tablets, 250 million capsules, 20 million bottles of syrups and suspensions, 10 million tubes of creams and gels per year. All stages of the manufacturing process undergo automatic testing and are certified for microbiological purity. 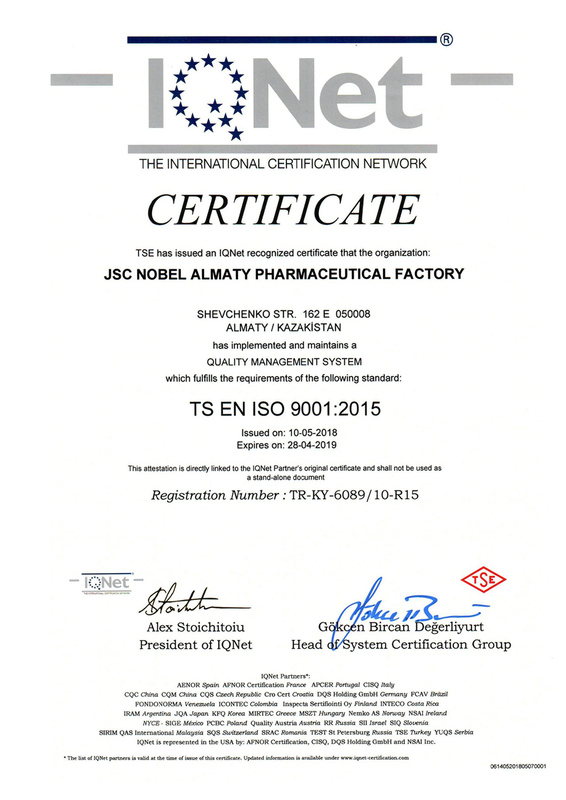 The quality of the intermediate and final product is controlled in an accredited laboratory of the company equipped with modern analytical equipment. 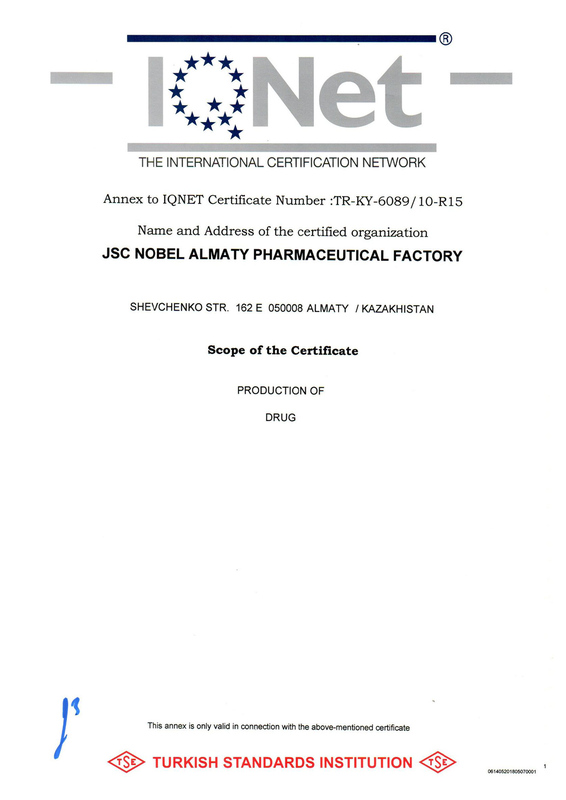 Today, the product range of Nobel AFF is more than 200 names of drug products. These drugs used for the treatment of diseases of the cardiovascular, respiratory and nervous systems, gastrointestinal tract, antibacterial, antifungal, antiviral, anti-inflammatory, analgesic, antipyretic agents and others. Certified by national and international bodies, Nobel AFF operates in accordance with international standards. 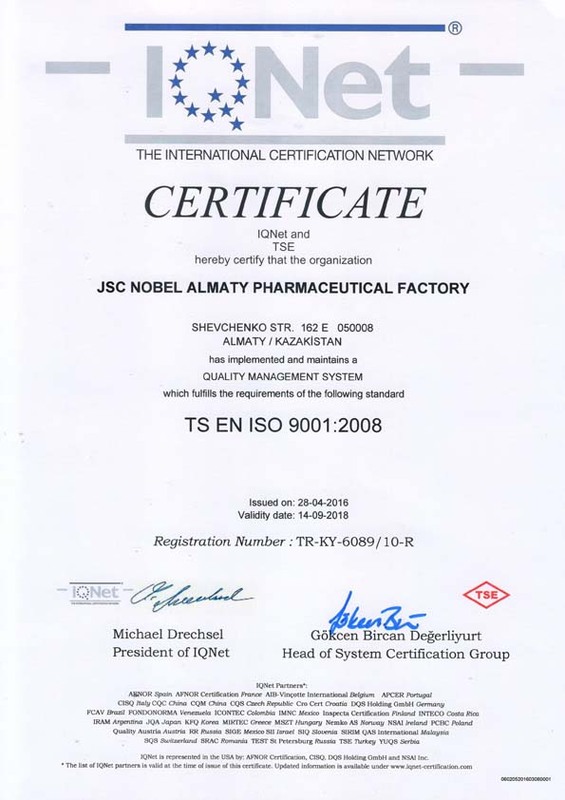 The company has ISO 9001:2008 and ISO 17025 certificates, which confirm the quality of Nobel AFF. 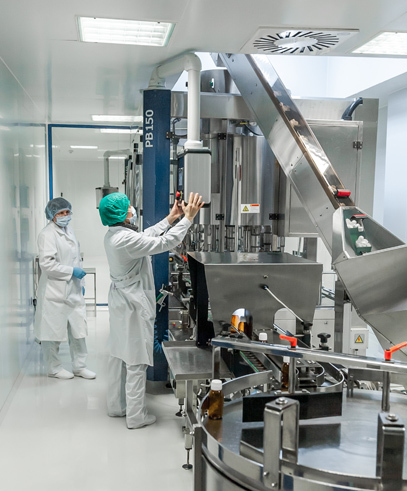 National and international health services pay great attention to the quality of pharmaceutical manufacturing facilities, as well as to monitoring and studying the effectiveness of pharmaceutical products. Moreover, Good Manufacturing Practices (GMP) determines high standards, provides an expertise according to the national legislation on assessing the quality of pharmaceutical products. 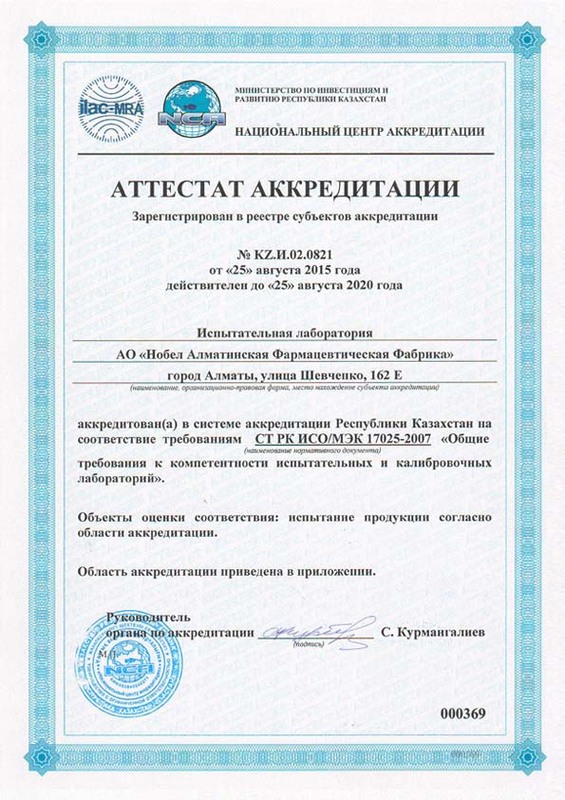 Nobel AFF is one of the first pharmaceutical manufacturers in the Republic of Kazakhstan, which received a GMP certificate.